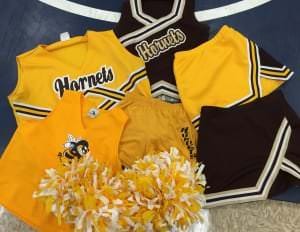 INDIANAPOLIS – Jan. 21, 2016 – Herff Jones announced its support of TC Howe High School in Indianapolis through the donation of cheerleading uniforms after the cheer team received criticism about outdated, mismatched uniforms worn on a WTHR television appearance last October. The school lacked a consistent cheerleading program until Ashley Collins, member of the school staff, stepped in as coach this fall. After an unsuccessful fundraising effort, the small but mighty cheer team pulled together uniforms from years past, as well as warm ups from the girls’ basketball and track teams for their appearance on the WTHR program, Operation Football. “When the cameras were rolling, their smiles were brighter than the sun – an opportunity of a lifetime! Unfortunately, the girls received a lot of criticism about their appearance. The girls were taunted about their shoes, missing pom-poms, and mismatched uniforms; turning a moment to build confidence into a moment where I, as their coach, had to repair the team’s self-esteem,” said Collins. TC Howe High School came to the attention of Indianapolis-based Herff Jones after news of the criticism spotlighted the team’s need for uniforms. Along with support from alumni and the community, Herff Jones supplied uniforms manufactured by sister company, Varsity Spirit. The uniforms included skirts, tops, shells, warm-up pants and jackets, pom-poms, shoes, briefs and hair accessories. “Bettering the communities we serve by supporting student achievement and school spirit is important to all of us at Varsity Brands. When we read about the challenges facing the TC Howe High School cheerleaders and their determination despite some criticism, we wanted to step in and help,” said John Newby, President of Herff Jones. The cheerleading team will reveal their new uniforms at their next home basketball game on Saturday, January 30 at 6:00 p.m. The team is preparing a special half-time performance and will be available prior to the game for photos and interviews.